I’m often tempted to stop reading fiction. Coming from a writer, that must sound strange. I can get well and truly lost in a good novel, and it bothers me. I like to be present and mindful. It’s hard to do when you are immersed in someone else’s story. And so from time to time I go through phases of reading non-fiction exclusively (my last five, Radical Acceptance: Awakening the Love that Heals Fear and Shame Tara Brach; The 4-Hour Work Week: Escape the 9-5, Live Anywhere and Join the New Rich Timothy Ferriss; Sapiens: A Brief History of Humankind Yuval Noah Harar; Why Be Vegetarian: Debunking the excuses. Includes Free vegetarian recipes (The Good Life Book 1) Fee O’Shea and, just finished, House and Philosophy: Everybody Lies (The Blackwell Philosophy and Pop Culture Series) Jacoby, Henry). But then a yearning grabs me and I am compelled reaching for something different. For the power of story and fable and possibility. And so I find myself back on a fiction reading streak, which began this year with Terry Pratchett’s ‘The Shepherd’s Crown’ the 41st and last Discworld novel. When Terry died, I bought every book in the series and spent the year reading them in a kind of order. I revisited Roberston Davis’ ‘The Deptford Trilogy’ (which, I’m sorry, I concluded after much thought was just an exercise in intellectual masturbation. The Cornish Trilogy is far superior). And now I’m back with my current favourite author, David Mitchell. I stumbled across number9dream a couple of years ago and was immersed completely. And then there was Cloud Atlas, of course. 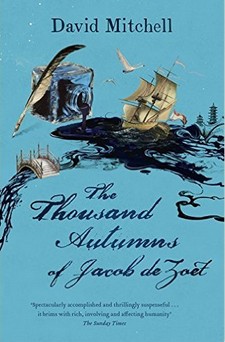 I’m currently re-reading The Thousand Autumns of Jacob de Zoet, which affirmed my opinion of Mitchell as possibly as good as Louis de Bernieres (whose Birds Without Wings I started re-reading the same day I’d finished it for the first time).